Joel Feder November 20, 2018 Comment Now! I’ve driven on racetracks, off road, and have played in the mud, but I’ve never launched a truck into the air—until now. I am nervous. 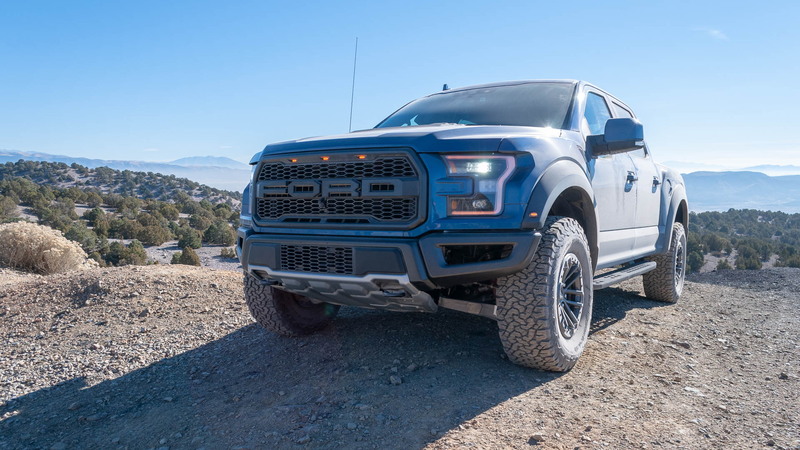 The 2019 Ford F-150 Raptor is still the only factory full-size pickup truck an automaker will encourage you to jump, and it has received a host of upgrades for this year. Highlighting the list are new electronic aids and revised Fox racing shocks to make it faster and smarter. 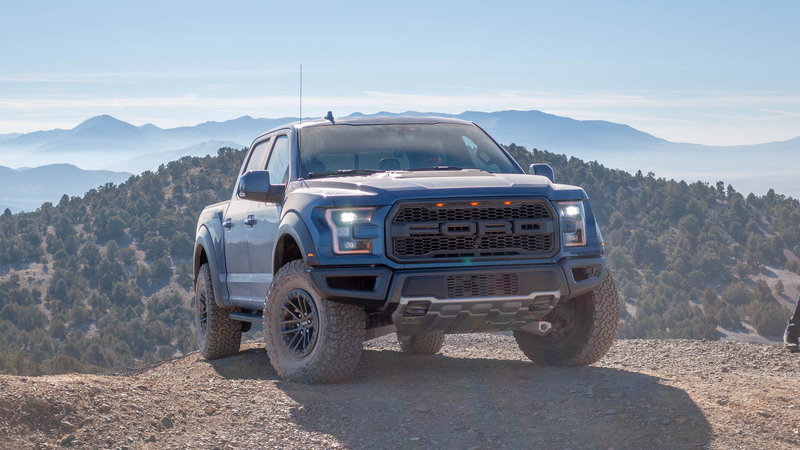 The Raptor’s 3.5-liter twin-turbo V-6 idled, its 450 horsepower and 510 pound-feet of torque laying in wait as the Velocity Blue pickup pointed toward the jump. Standing still on the short course track at Miller Motorsports Park in Erda, Utah, I received the thumbs up and mashed the accelerator. As I crested the first, smaller berm, I lifted off the throttle briefly so the truck wouldn’t go airborne and lose momentum. I then put the pedal to the floor again as the long blue truck climbed the second, larger rise. The red needle on the speedometer hit 40 mph. I lifted of the throttle again and felt the front suspension fully drop from under the truck as it went airborne. While all four wheels left the ground on my first run, 40 mph wasn’t 50 mph, and it could’ve gone higher, farther, and faster. It had more in it. For 2019, the Raptor has shucked its passive Fox Racing shocks for new electronically controlled Fox 3.0 Bypass shocks with Live Valve technology that adapt to the current terrain. The shocks retain bypass technology and a 9-chamber design, but now they have the ability to change the damping in real-time every 40 to 80 milliseconds. Electronic modules borrowed from the Lincoln Navigator have been reprogrammed to read throttle, braking, and steering inputs, as well as the terrain. The data is spit out to each system, including the suspension. The real-world results? The new electronic shocks make it so the Raptor is more controlled on the road, whether rounding a tight bend, tracing a long sweeper, or just coming to a stop. 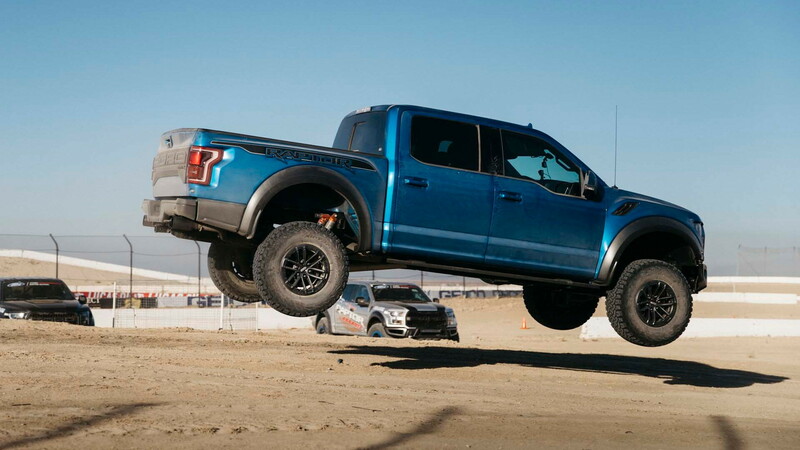 But it’s off-road that the new electronic shocks enhance the Raptor’s already absurd capabilities. Once airborne the electronics know the suspension has fully dropped and puts the shocks into full-firm mode to better cushion the jolt as the massive truck touches back down to Earth, and to help prevent it from bottoming out. In Sport mode, the shocks can be tricked to go fully firm instantly with a simple deep stab of the throttle. This allows the driver to prepare the truck for the rugged off-road event that might lie just ahead. My second run was a better test of how well the shocks help the Raptor absorb the blow of big jumps. This time I hit the 50-mph target speed at the ramp. Upon returning to the ground, the shocks absorbed the impact and the big blue truck continued forward with a single controlled rebound. Zero drama. Earlier in the day, before launching the Raptor into the sky, I blasted it down the rocky, gravel-covered Jacob City Trailhead. Driving in Baja mode, I manhandled the massive pickup down the trail at speeds of 40-60 mph. With a small incline ahead, I buried the throttle, shot skyward, and suddenly the nose was pointed back toward the ground. I had purposely carried too much speed. The front shocks fully compressed as they did their best to keep the the nose from hitting hard The front skid plate scraped the ground, but the 2018 setup would’ve bottomed out more violently as the shocks were half as firm as the 2019 electronic shocks in full-firm mode. 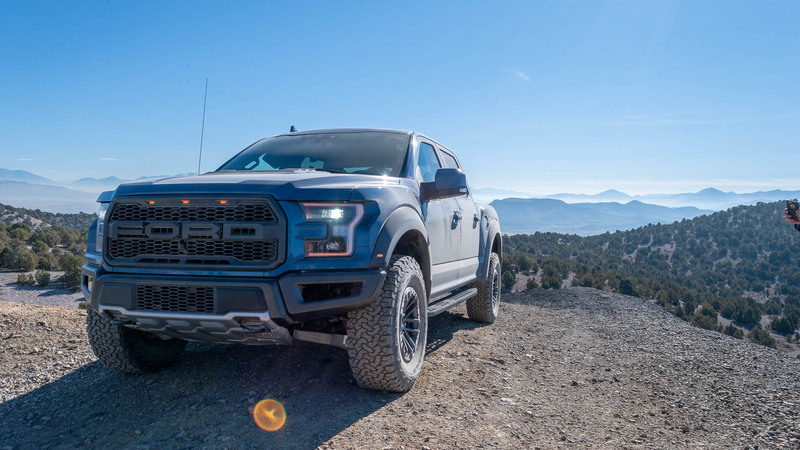 For 2019, the F-150 Raptor ditches its hill-descent control for a new Trail Control system (which is set to spread throughout the F-150 lineup in short order, according to Ford). In short, it’s cruise control for off-roading, both uphill and down, just like the system in a Range Rover. Hit the Trail Control button and the throttle and brake are handled automatically as the driver sets the speed between 1 mph and 20 mph via steering wheel-mounted cruise control speed buttons. I found the system to be just as capable as what’s found in the latest Range Rover products, and without the lurching you get with the system in the Toyota TRD Pro products. During my run, Trail Control used engine torque and applied individual brakes to help the Raptor go up and down rocky hills at a consistent pace. Sensors detected hurdles such as rocks and ruts and increased or decreased engine torque to clear the obstructions, but still kept the steady pace. Trail Control will make the adventure far easier and less stressful for Raptor buyers without off-road experience. It takes a lot of the guesswork out of the equation and lets the driver focus on steering inputs to place the truck in the right spot. Experienced off-roaders might find it handy in certain situations, like when full attention to wheel placement is key, but they may also feel it removes some the need for off-roading skill. That also eliminates some of the fun and work out of the off-road adventure. It’s autonomy for off-roading. One look at the 2019 Raptor and it’s not immediately clear that it’s been updated, but a keen eye will spot the updated design of the standard 17-inch wheels. Same goes for the optional bead-lock-capable wheels). The optional exterior exterior graphics package has been redesigned, and the lovely Recaro seats, with a smidge of extra bolstering to help keep those inside from being tossed around on the trail, are part of the Blue Interior Color Accent Package for $2,395. Velocity Blue and Performance Blue have replaced Lightning Blue, while Shadow Black has been replaced by Agate Black that gets some metallic flake. Likely to be most overlooked, the engine cover has been redesigned to look similar to the functional heat extractor on top of the hood. When the Raptor launched in 2010, many wondered why Ford created an high-speed off-road truck instead of another F-150 Lightning. Fast forward to 2018 and the Raptor clearly started a movement. Chevrolet has the Colorado ZR2, Toyota the Tacoma TRD Pro and Tundra TRD Pro, and Ram the 1500 Rebel. The Colorado ZR2 and Toyota Tacoma TRD Pro are the closest competitors as they can handle both trails and high-speed desert running, but they’re not full-size pickups and they don’t have performance powertrains. Nine years later, the Ford F-150 Raptor is still king of the off-road pickup trucks. It costs $54,350, which is $2,180 more than 2018, but with the updates for 2019 it’s now smarter, faster, and more capable than ever. Want proof? 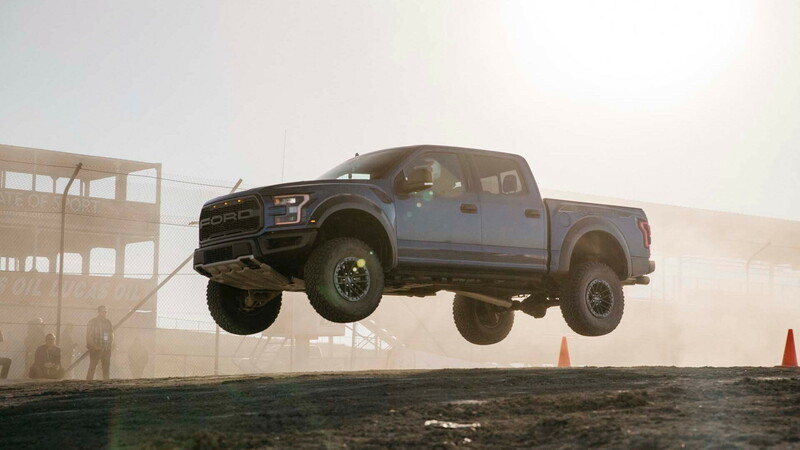 On my third and final jump in the 2019 Ford F-150 Raptor the speedometer read 58 mph—8 mph over the instructed launch speed—as the truck went airborne. I sent it, and it went flying. The truck didn’t care, and neither did Ford. Ford provided travel and lodging to Internet Brands Automotive to bring you this firsthand report.